Rows of poplar trees have had a place in the Dutch landscape for many years, often in hard straight lines cutting across the fields or following a road or lane. The poplar though as a tree is it would seem, losing its popularity and the rows of spectacular verticals set against the horizontal landscape are increasingly being removed. Near where I live in the centre of the Netherlands one of the most spectacular avenues in the country is living on borrowed time. Some 900 trees are due to be removed over the next couple of years. The landscape on the edge of the town of Wageningen it is fair to say, won’t be quite the same without them. 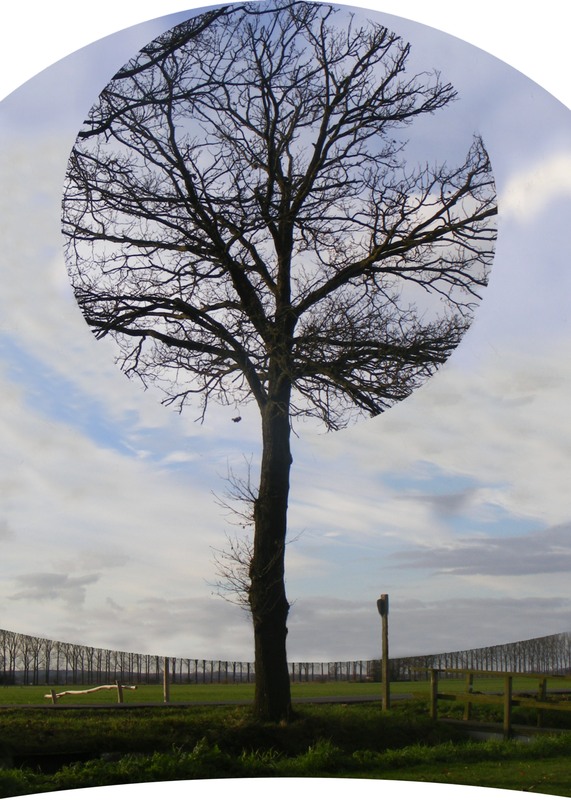 Writers, artists, photographers, runners, birdwatchers, sound recordists and others have contributed to a new book that reflects on the trees, there presence in the landscape, their importance to us and ultimately what their removal will mean to us. 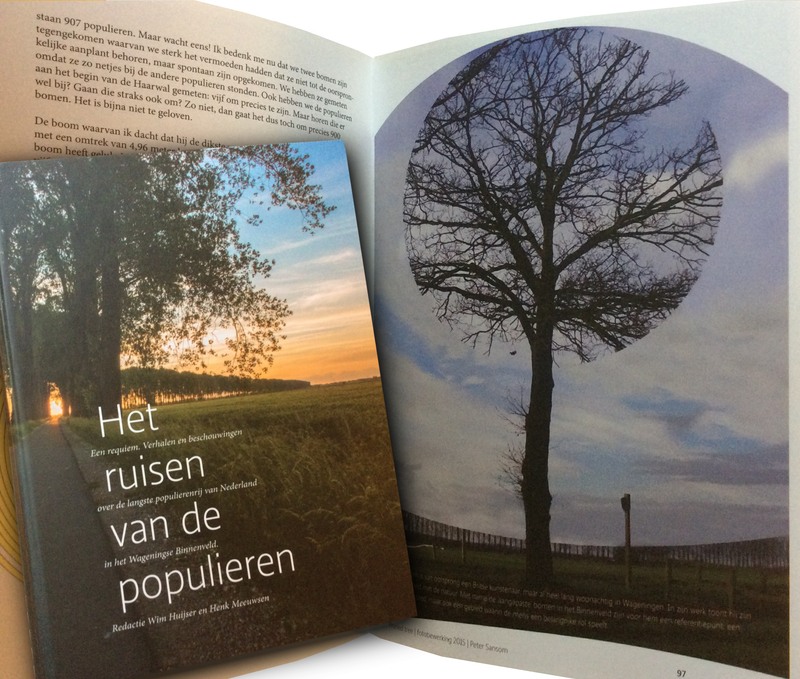 Wim Huijser and sound recordist Henk Meeuwsen have taken the lead in assembling the book, but I too have contributed to “Het ruisen van de populieren”, or in English, “The Rustle of the Poplars”. There can be few landscapes around the world that are as manipulated and carefully managed as the Dutch landscape. The presence of man and the control he exerts is almost always present, sometimes subtly, sometimes in a more extreme form. My manipulated photograph for the book connects with this and the way the landscape forms the scenery for our lives. Establishing clearly defined areas of creativity when working with young people is something I’ve posted about before, it is something that, as an art educator I feel quite strongly about. This week I’m being reminded about again through an assignment that I have set. The assignment is part of a photography module that I am working on with my fourth year class (15-16 year olds in the Dutch system of education). We’ve spent time in the lessons looking at examples of good portrait photography, the pupils have compared photographs and written about them. But ultimately the core of the whole project is getting the pupils to take their own photographs and trying to insure that the photographs are more that the bulk of the photographs these teenagers take in the average week. This is a generation that take so many photographs. This is fantastic in so many ways, the freedom to experiment, the minimal cost involved and the ease with which they can share their creative discoveries. The big down side though is that they rarely stop to think about what it is that they are doing, everything is a snap shot, instantaneous and so often just for amusement purposes. With this in the background, it is actually often quite difficult to get the sorts of photographic results that you might hope for. The assignment that I have been experimenting with is essentially a portrait assignment, not so much about ensuring that the portrait photograph discloses something about the subject, it is simply more about encouraging the pupils to look carefully and critically at there’s on that they are photographing, consider how they are framing them up and how that they are controlling light. The assignment is based on an idea that I came across on the www.booooooom.com website although I have also seen work by other photographer doing similar things, such as the Dutch photographer Hendrik Kerstens. For the project I gave the pupils a selection of five Vermeer and five Rembrandt portraits to use as a basis. 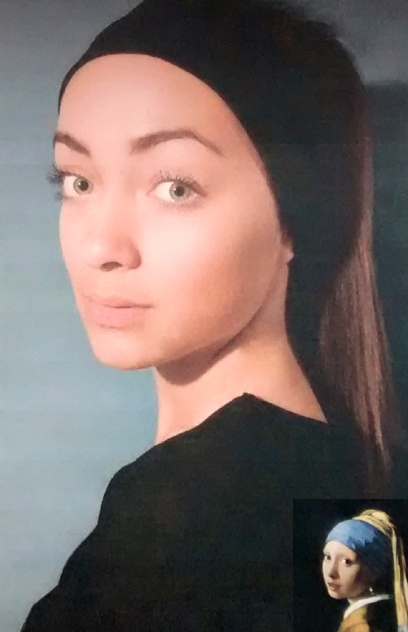 They simply had to create their own photographic versions of the portraits. It was not so much about dressing up or gathering attributes to fill the picture, but more about creating the ‘look’ of the painting, simulating the glance, creating a comparable composition. By allowing the pupils to play the role that the original offered seems to have removed a lot of the self-consciousness that might otherwise get in the way. They step in front of the camera knowing what they have to do. The endless possibilities that the camera normally offers is framed within some limitations, but these limitations allow the chance to focus on the issues I want them to focus on. This is the strength of the project I feel.